Before Christmas I took a couple of drawing classes with Dawood Marion at the Sharon Art Studio in San Francisco’s Golden Gate park. If you ever have the chance of taking one of his classes you should – he is a very energetic teacher. His instructions are geared towards drawing in public without worrying too much about the outcome. 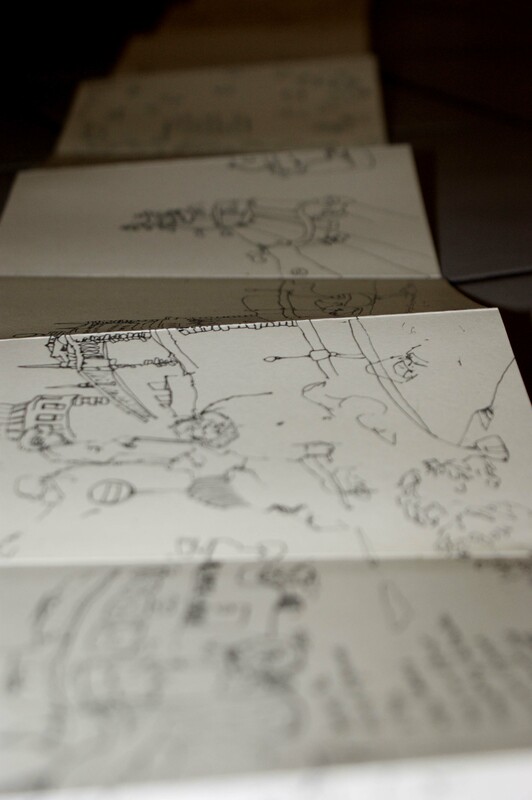 Your scenery might change constantly but what the hell – just have a good time putting your point of view on paper! People walk and don’t pose, buses start moving while you draw a street view out of their windows and all of that without advance notice. Despite or probably because of that the drawings that emerge often have a very fresh and lively feel! Of course such a style lends itself to the visual flaneur whose attention might be caught by an event or sight transient in nature. I had experimented with this fearless approach to mark making before and now learned that it had a name – reportage drawing. 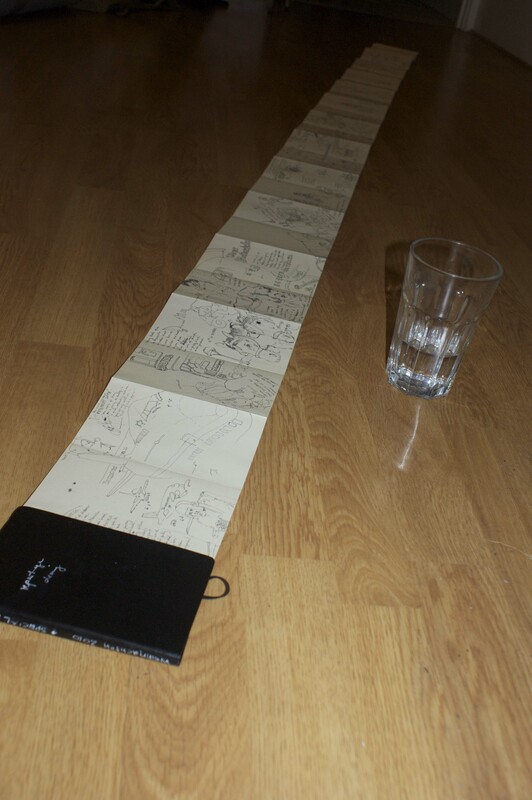 Soon after that I went traveling to Vienna over Christmas and installed myself a challenge: I would fill an entire accordion fold out notebook with a continuous drawing of my experience. With micron pen. No erasing. So no matter where I went the notebook was always with me and quite often I would stop in the middle of the street to put something down. I am glad I was accompanied by patient friends. I also ventured on little urban expeditions by myself and discovered treasures I wouldn’t have were it not for walking with open eyes and attempting to draw my findings patiently. More or less – it was quite cold after all. I am proud that I managed to fill the 30 x 3.5 inches worth of paper with my impressions of Vienna assembled along an imaginary timeline from left to right. Even more – I really like the way it turned out! From that notebook I took one stretch that I named ‘Vienna with San Franciscan eyes’ and finished it with watercolor. I’ll show you soon! this looks so awesome!! i love the idea of a visual timeline of a trip like this. 🙂 also, i figured out what visualflaneur means! yay! Thanks Angi. I hope you’ll enjoy the detailed views to come! Geniale Idee! Vergiss bitte nicht, mich auf Deine naechste/ erste(?) Vernissage einzuladen. Danke Daniela! Ich werde dich auf dem laufenden halten :-). You work is beautiful. Keep going!!! Thanks a lot Dawood. I definitely will. I’ll be honored if you manage to check this humble site once in a while. Looking forward to the unveiling of your latest project on Monday!